See our impact of the families of Hawai’i, click here! If you would like to make an online gift to Child & Family Service, please click here. 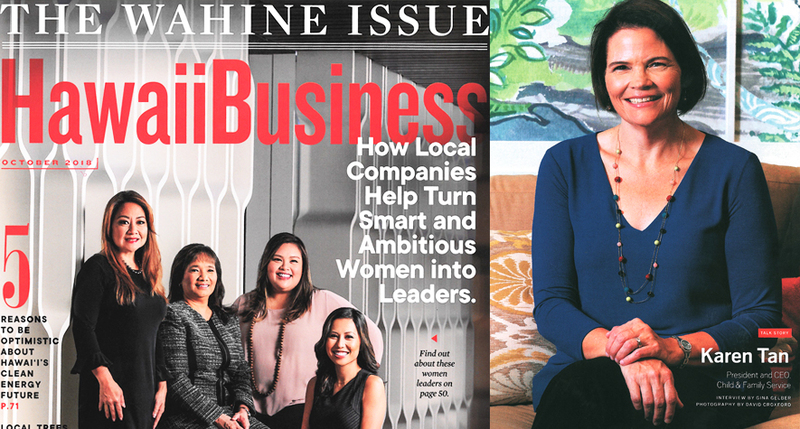 Click here for the Hawaii Business Magazine online article. Our community’s collective response to the threat of Hurricane Lane demonstrated the positive power of organizations large and small, and family members of all ages, working together to support each other in times of crisis. Mahalo nui loa to Hawaii’s print and broadcast news media for their many hours of updates and coverage in keeping our community informed; to Gov. David Ige and Mayors Kirk Caldwell, Harry Kim, Alan Arakawa and Bernard Carvalho for their actions to keep families safe on each island; and to emergency response preparedness and response from state and county departments as well as community organizations. I join with Hawaii’s nonprofit community in also thanking the many staff members who, in the midst of making hurricane preparedness preparations for their own families, also worked extra hours to make sure that families in need, such as those in domestic violence shelters, were able to stay safe and secure during the hurricane period. As we work to help those impacted by the effects of Hurricane Lane, and to prepare for future hurricane season activity, keeping a watchful eye on the physical and mental health of Hawaii’s families, especially our children, should remain a primary focus. After the threat or impacts of a hurricane, most families will recover over time, particularly with the support of family, friends and a network of support such as community organizations and resources. Some families will be able to return to their normal routines rather quickly, while others will have to contend with repairing damage to their home and facing financial hardship. Even families without property damage may have had to shelter in place for long, uncertain periods due to heavy rains and unsafe conditions. Children starting the school year may be apprehensive about the future. Signs of stress may include difficulty concentrating in school as well as changes in sleep, exercise and diet. The National Traumatic Child Stress Network recommends tangible actions both before as well as after a potential natural disaster. These include adults modeling calm behavior for children, providing accurate information to their children about what happened during the storm as well as what changes the family is facing. Answer questions honestly but with the amount of detail appropriate to their developmental level. Keep family routines as regular as possible and set limits on media and social media information about the hurricane. Parents and caregivers, too, may benefit from finding opportunities to take a moment for themselves to reflect after the week’s activities leading up to Hurricane Lane, expressing their feelings, acknowledge that these events are scary situations and engage in positive ways to prepare for future potential watches and warnings. Child & Family Service administers The Parent Line, a free statewide confidential phone line funded by the state Department of Health, to help parents learn ways to manage the strong emotions that come with traumatic events. The Parent Line is available toll free at 1-800-816-1222, 8 a.m. to 6 p.m. Monday through Friday, and 9 a.m. to 1 p.m. Saturday. Our agency works daily with families whose lives are challenged through issues such as poverty, abuse and neglect. We are inspired constantly by the resilience of parents, children and kupuna in creating strong lives for themselves and for the next generation. Hawaii’s collective family of individuals and organizations working together are our best hope for a strong future for our state. Click here for the Hawaii News Now Article and Video segment! The recent Kaua‘i flooding and Big Island volcanic activity are affecting families not only in terms of their housing and property needs, but also through lingering emotional reactions for all ages. These aftershocks of the events are real and normal and can require time to process, and sometimes a helping hand of support. As a recent Honolulu Star-Advertiser editorial noted (“Show aloha to volcano victims,” Our View, May 8), our community has come together for relief efforts, large and small, to help families affected by the volcano activity on the Big Island, as well as those who lost homes and property in the Kaua‘i flooding last month. Community care in the short- and longer-term will be needed as well for emotional support, as families struggle to process and to recover from the effects of these two events. A Big Island resident described the experience as being on an emotional roller coaster. For adults, the sudden loss of items dear to them and homes damaged by the flooding and volcano, have shaken the very foundations of their lives. For children, there may be fear and apprehension about what has happened, and about what may come. These feelings may be true not only for children directly affected in the Hanalei and Puna area communities, but also for keiki on other islands who have read or heard about the recent events. After a disaster or traumatic event, especially ones of this magnitude, it is important for families to take care of their emotional health, and to pay attention to how family members, especially children, are feeling and acting. To help those who are having a hard time coping with the impacts of these events, Child & Family Service (CFS) is providing free, one-on-one counseling services to island families. We are very grateful for the community partnerships that are making this possible. On Kaua‘i, funding for counseling is being provided through the Hawai‘i Community Foundation Kauai Relief and Recovery Fund. On the Big Island, First Hawaiian Bank, along with a private donor, is providing vital funding to help families in greatest need with housing support and tangible needs as well as counseling services. 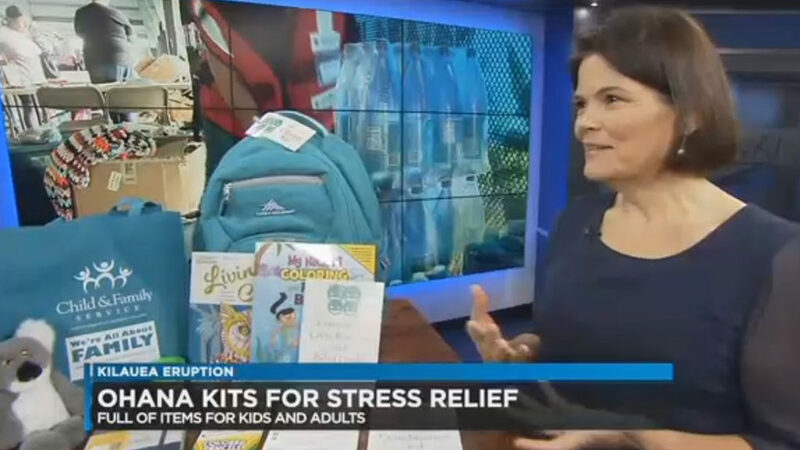 Counseling services through CFS as well as other community providers, many of whom are volunteering their time even though they themselves have been affected by the flood and lava, can help parents to identify signs of the effects of trauma. Those include changes in sleeping and eating patterns, and ways to help them that include keeping normal routines or making new ones together. Helping children to talk about their feelings and reassuring them about their safety are important at this time. Our kupuna also deserve our attention and support to help them to process the events and to have a support system in place. Adults, as well, should make time to unwind and connect with supports such as friends, families and community services. Give yourself and your children time to heal from the experience. There is no right or wrong way to respond. Over time, family members should see a reduction in the overwhelming feelings. If further assistance is needed, coordinated resources of public and community agencies working together can provide support, and hope, for families as they work toward recovery. We’re all in this together. April is Sexual Assault Awareness Month as well as Prevent Child Abuse Month across our nation and our state. As nonprofit and community organizations come together with month-long activities to raise awareness of these serious family issues, keeping a focus on preventing abuse, and addressing abuse and neglect as soon as possible if it is already evident, can have lifelong impact on our children and their future. Child abuse and neglect describes all forms of physical and emotional abuse, sexual abuse, neglect, negligence and any other exploitation that harms the health, development, dignity or survival of a child under the age of 18 years. The World Health Organization states that worldwide around 20 percent of women and 5-10 percent of men report being sexually abused as children, while 23 percent of individuals report being physically abused during childhood. The American Journal of Psychiatry has found an association between child abuse and the reduction of gray matter in the brain that is responsible for information processing. The research found that the individuals who had been exposed to childhood maltreatment had much smaller volumes of gray matter in certain brain areas, compared with those who had no history of child abuse. Since these brain regions develop relatively late — after the child abuse may have occurred — the Journal study says this may explain why some victims of child abuse typically have compromised cognitive control. Preventing child abuse before it occurs is our community’s best opportunity to help our children to develop to their full potential mentally, physically and socially. At Child & Family Service, our Healthy Families program is a national model that started in our state to prevent child abuse and neglect by helping at-risk families in the first three years of children’s lives. Parents of newborn children are screened and if found to be at risk for child abuse and neglect, are invited to enroll in the program. Families receive support from trained professionals, who provide parenting education, model effective parent-child interaction, and ensure that each child has a primary care physician. Over 99 percnt of parents who participate in the program for a year or more have no results of abuse. For families already dealing with the trauma of abuse and neglect, early intervention can still have life changing impact for children and give them hope for healthy brain and emotional development. All of our professional staff is trained in Risking Connection®, an evidence-based program that addresses trauma through the lens of its root causes rather than treating behavior. We work the whole family to help them to achieve positive parenting skills and support their children with love and care. We have been pleased to work with other nonprofits and to train them in this program and in measuring the results of their efforts as well, and as a community, to learn cooperatively with the interests of families at the forefront. Keeping our children safe and healthy is a community effort that no one organization can achieve by working alone. Nonprofits and community organizations across the state deserve our support and participation to make meaningful and lasting change for our keiki. Through these collaborative efforts, our social services community can collectively help our children as well as parents to heal from trauma, to be nurtured as strong families, and to in turn nurture our future generations with strength and caring as well. The effects of Saturday’s mistaken alert of a ballistic missile launch will require immediate attention as the state of Hawaii works to ensure that this does not happen again. The emotional impacts of the false alert on the lives of Hawaii’s families, and especially our children, also need our community’s care, counseling and compassion. Honolulu Star-Advertiser interviews with those affected ranging from young parents, University of Hawaii students, tourists and members of the military point out the wide-ranging emotions and fears of this jarring event in the immediate response of the situation. Parents, spouses and friends found ourselves dealing so suddenly with the unknown and in many cases reaching out to take care of others as well dealing with our own emotions, as I did as a mom with three children in college, high school and middle school. The intense, confusing and frightening emotions that follow a traumatic event can be even more pronounced in children, and becomes an issue for parents as they seek support in how to talk to their children about the events that played out and to help them to process the confusion or uncertainty that they may be feeling. Fortunately there are many resources available to families in our community, including school and clinical counselors, community agency programs, Employee Assistance Programs (EAP) to assist employees through workforce services, as well as parent resource hotlines. Child & Family Service (CFS) administers The Parent Line, a free statewide confidential telephone line funded by the state Department of Health. Experienced phone-line staff help parents to problem-solve parenting challenges and child adolescent behavior and are available to help parents learn ways to manage the strong emotions that come with trauma. We have extended our hours during this first week following the false alert event to better accommodate families and continue to be available for families here. The Parent Line can be accessed at 808-526-1222 (Oahu) or 1-800-816-1222 (neighbor islands), Mondays-Fridays, 8 a.m. to 6 p.m. (this week, until 8 p.m. today through Friday) and Saturdays, 9 a.m.–1 p.m. In many cases through the support of family and friends and giving family members time to heal, the normal reactions to trauma are reduced and begin to subside over time. Occasionally, the traumatic event is so painful that professional assistance may be necessary. This does not imply weakness, but rather simply indicates that the particular incident was just too powerful for the person to manage alone. In the case of children, parents’ protection, nurturing and guidance speeds recovery and support children coping in the face of trauma. Reassurance is key to helping children through a traumatic time, and parents should answer questions about the event honestly, but not dwell on frightening details or allow the subject to dominate family or classroom time indefinitely. Conversation, writing and artwork also are ways to encourage children of all ages to express emotions as are finding a way to help others who were affected by the event. It’s also fine for parents to acknowledge that they, too, might have reactions associated with the traumatic event and to take steps to promote their own physical and emotional healing. One definition of trauma is: a normal reaction to an abnormal event. Focusing on ways that we can pull together both as a state and as families to learn and to heal from this unfortunate event will build a stronger and more equipped community for all of us. Hawaii is a very giving community, and during the holidays we see that generosity taking place across businesses, nonprofits and community organizations in our state. Donations and efforts big and small can have huge impact on the lives of families struggling to make ends meet and offer joy and hope during the busy holiday season. Those types of community efforts can also be game changers for families throughout the year, especially for so many in our state facing poverty, homelessness and despair in light of Hawaii’s high cost of living and its related impacts. According to the American Academy of Pediatrics, poverty is one of the greatest threats to child health. Poor children have increased infant mortality; more frequent and severe chronic diseases such as asthma; poorer nutrition and growth; less access to quality health care; lower immunization rates; and increased obesity and its complications. Poverty and economic hardship is also particularly difficult for parents who may experience chronic stress, depression, marital distress and exhibit harsher parenting behaviors. These are all linked to poor social and emotional outcomes for children. Over the past year, Child & Family Service has partnered with a program called Transition to Success to pilot a national model in Hawaii that treats poverty as a diagnosis affecting a family rather than a character flaw. Through our Family Centers on Maui and Kauai, we worked with families to map their dreams and help them create a path to get there. Youth who said they wanted to become NBA basketball players were not discouraged, but rather helped to put in motion the pieces to get there, such as a good education, which would motivate them to do well in school and get them on the path to confidence, achievement and self-sufficiency. The success of the program is predicated on setting goals and dreams for family members, but bringing those dreams to fruition requires the collaboration of many community partners. On Maui and Kauai we partnered with more than 15 agencies, businesses and organizations who could provide important pieces to the puzzle, such as basic needs, literacy, getting an education including GED and higher education for parents, financial literacy and volunteerism, job training and placement, all key components for self-sufficiency. Data is being collected to measure the effectiveness of this pilot and so far, the results are promising, with 80 percent of participating families meeting at least two of their stated goals during the year. Last month, I had the opportunity to present the findings of this pilot project at a national conference of state leaders, along with Marcella Wilson, founder of the Transition to Success program. Upon returning home, I was surprisingly greeted with several emails from attendees wanting to learn more about how to create a community of partnerships in their states as well. Hawaii’s economic challenges and the effects of poverty in our community are evident, but so too are the opportunities for our state to serve as a model to others of the impact of our collective cultures and communities to make measurable and lasting change in the lives of our families.